The simple desk supplies are the ones that get things done. 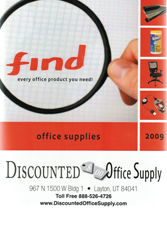 From adhesives to pencils, Discounted Office Supply.com has the desk supplies you need at great prices. We pride ourselves in our huge selection, great service and fantastic prices. As an online retailer of janitorial and office supplies, we carry everything you need for your business or home office-all in our 36 distribution centers located throughout the United States. Browse the category you need below and order today.